Should your New Camera use Tape or Hard Drive? When planning to build an announce booth, some considerations need to be made. The first may be what defines an ‘effective’ announce booth? After all, as many different types of film directors and producers there are in the world, there are nearly as many different definitions for the word ‘effective.’ There is also the consideration of cost versus ultimate usage. Is this announce booth going to be used as a one-time operation or will it be something more permanent, something that will be used in more than one production? Recording clarity is essential to a good quality audio recording. Far too many novices take the process of voice recording too lightly. After all, when a room is kept quiet, when there is no audible interference during the voice-over or narration recording, it may seem fine. However, even in the quietest room or location in the world, sounds will bounce and the clarity of the recording may be compromised. It may not seem to be the case at first blush, but when voices, or vocals, are recorded in the wrong environment, when attempting to insert or overdub them into film, the natural sounds and acoustic reflections will become audible and this will force filmmakers and editors into the difficult task of masking these reflections and noises within the mix itself. This leads directly to a degradation of quality, and that is something that can be avoided with the simple construction of an announce booth. There are a few essential things to keep in mind when building an effective space for this task. The first is sound proofing materials. Foam, carpeting, and any sound absorbing material are ideal. The next is size. The best voice-over or announce booth should be no larger than five feet to six feet. Anything larger than this will allow the vocal sounds to bounce in different locations, creating reflection and echo that you may not hear upon recording. When you set out to build an announce booth, determine whether this will be a permanent construction, or something that will only be used for a brief period of time. For a permanent construction, then you will want to set the booth in a location where the recording console controller has visual line-of-sight with the person performing the narration. This makes communication more than one-dimensional (i.e. through headphones and microphone only). Next, you will want to build a room approximately five feet by five feet six inches. The height should ideally range from seven feet to eight feet. This ceiling height measurement isn’t an approximation. By having the rear of the voice-over booth at seven feet and then angling up toward the front of the booth at eight feet will help dissipate the sound waves. Using a door with a window is a good idea, again to keep that line of sight with the control room open. Use sound absorption sheets throughout the room to reduce the echo, reflection, and reverberation. This will ensure that the only sound that is picked up by the microphone is the person’s voice. Note: adding sound absorption sheets to the ceiling is crucial as well. In the end, when you take the time to build an effective announce booth, don’t cut corners with the recording equipment. 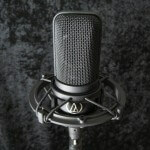 Be certain to use the highest quality microphone that you can afford, along with headphones that isolate sound (it defeats the purpose of the voice-over booth when the microphone picks up sounds coming from the headphones).